Register for spring formal recruitment here! 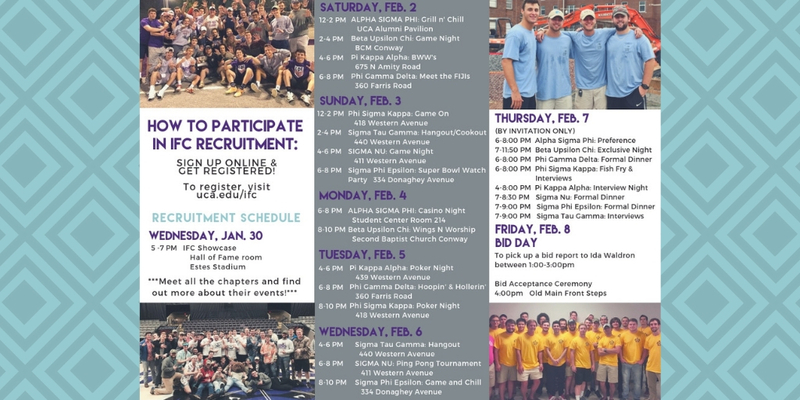 IFC encourages year-round recruitment with an additional structured “recruitment week” each fall and spring semester. Once a student has achieved the minimum university eligibility requirements, they are able to join a fraternity. Bids may be issued and accepted by registered, eligible individuals in accordance with University and IFC policies during fall and spring semesters. Although the university requirement for eligibility in a fraternity or sorority is a 2.5 GPA, the Interfraternity Council has raised the bar and set a strict requirement of a 2.75 GPA. Recruitment is a 365/24/7 process, so events may be held outside of these periods at the discretion of the organization. For information on additional events outside of the informal/formal recruitment week, please contact the organization of interest.